It doesn’t take much to make me want to visit a place. A video or a photo is sometimes enough to make me fixate on a destination or event, and I will do what I can to go there. In this case, it was a tarpaulin. Back in December 2010, Cla, Chris and I were driving from the Kalibo airport and into the town when we saw Jenny’s sign near the plaza. For some reason, we fixated on it. It didn’t help that Chris and her family, who have been living in Kalibo for years, have no clue who this person was. It was easy enough to search for information on Facebook, but unfortunately, Cla and I weren’t able to come back to Aklan for the 2011 ati-atihan festival, and Chris was running a fever and therefore, wasn’t able to look for her. This year, we were all set for ati-atihan, but Chris sadly reports that there was no tarps announcing her return to this year’s festival. Once again, Facebook comes to the rescue and we found out that Jenny will be parading with her band of super heroes. The downpour throughout the afternoon put a damper to our spirits. After the rain has stopped for some time, we ventured out, hopeful but not entirely optimistic. We were swept away by the music and the energy of the crowd, and as we rounded a corner, Cla suddenly yells that she has spotted the Wonder Woman of Aklan. It may seem weird that we’re fixating on this person dressing up as a superhero, but there’s something about her that makes us happy. Different strokes for different folks, and if there’s something that you know would make you happy, go out and go after that something. Kalibo is already in fiesta mode, even if the main event isn’t until Sunday. Every afternoon, there are activities around the city that goes on until late in the evening. If you are flying into Kalibo enroute to Boracay or flying out of Kalibo from Boracay, bear in mind that a portion of the main road is closed to vehicular traffic. Give plenty of time allowance if you will be catching a flight. The weather forecast for the next couple of days is rain, so come prepared with your rain gear and waterproofs if you want to take photos or participate in the festival. 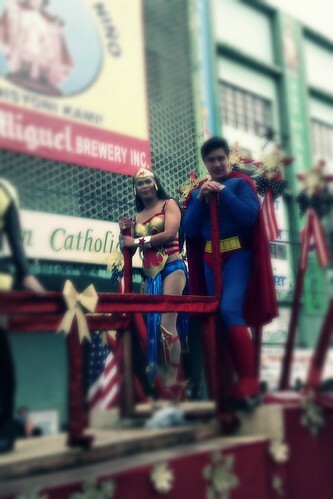 mas malaki pa biceps ni wonder woman sa foam covered braso ni superman! Nakakahiya… my parents hail from Aklan and I visit Aklan almost every year. At hindi pa ako nakakapanood ng Ati Atihan :(. Aww sayang, uwi na kami sa 18th! Happy New Year, Nina, it was fun traveling with you Love your pics! Hugs from a faraway, snowy place! Hang cute naman ng costume2! never pa ako nakapag ati-atihan sa Aklan and hopefully next year ma experience ko xa. thanks. I hope I could watch Ati-Atihan in Kalibo. Thanks for sharing. Hindi man lang tayo nagkita, kahit saglit. Over kasi sa dami ng tao. hehe. Pero, crush ko si Superman at Flash ha. Cute si Flash sa malapitan. Hahaha! Where will your Wanderlust take you in 2012?